When you're driving, the last thing you need to be doing is messing around with your phone. But these days, people expect you to be available at all times, so the text messages continue to flow in while you're on the road. It's a terrible distraction, and one that is responsible for 25% of all car wrecks in the United States. If you had an iPhone, you could set up Find My Friends so that the other people in your life knew you were driving and left you alone, but this app isn't available for Android. On the other hand, Android has an awesome feature that lets apps share data with one another, which opens the door for a third-party solution. Using this approach, developer Sandor Sergiu created an app that can share your location with a simple SMS message. 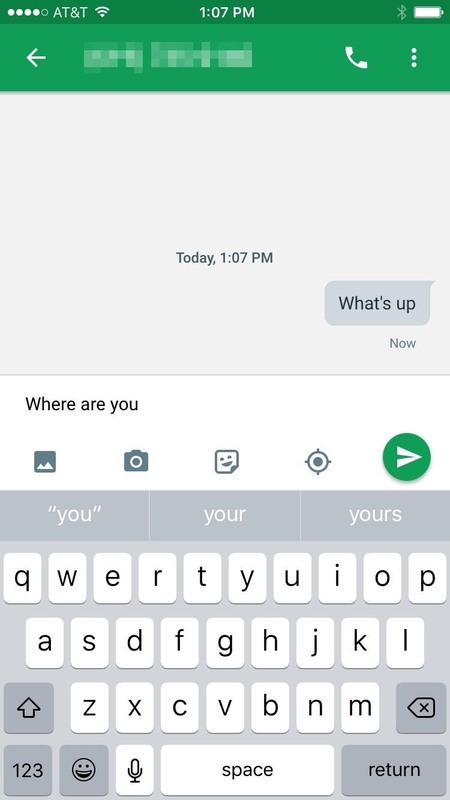 The app detects when someone texts you a keyword, then automatically sends a message back to them containing your current location. It doesn't matter what kind of phone the other person has, but at the same time, this type of functionality is only possible because of Android's openness. If you're ready to start driving a bit safer, just install the app, which is called Locate driver. 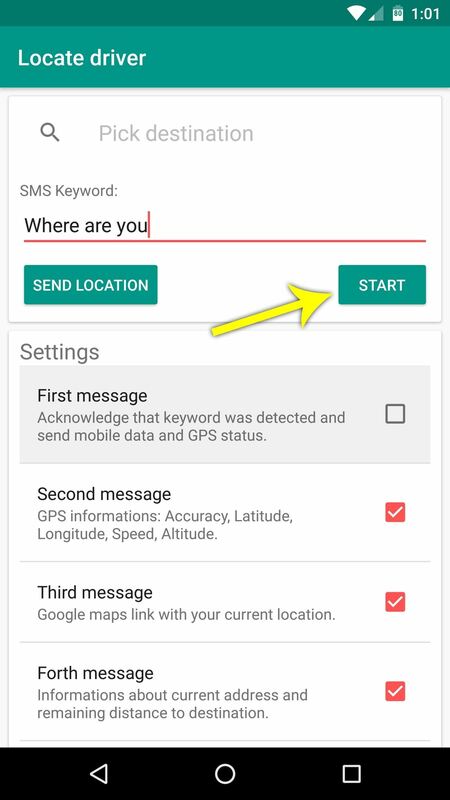 Then, if you're running Android Marshmallow or higher, you'll have to grant Locate driver permission to view your SMS logs and location data, so tap "Allow" on the two popups you'll see when you first launch the app. From here, Locate driver is pretty simple to use. For starters, if you'd like to share your destination instead of just your location, you could enter an address into the Pick destination field at the top of the screen. Aside from that, Locate driver will only send your location if the other person texts you with an exact keyword. 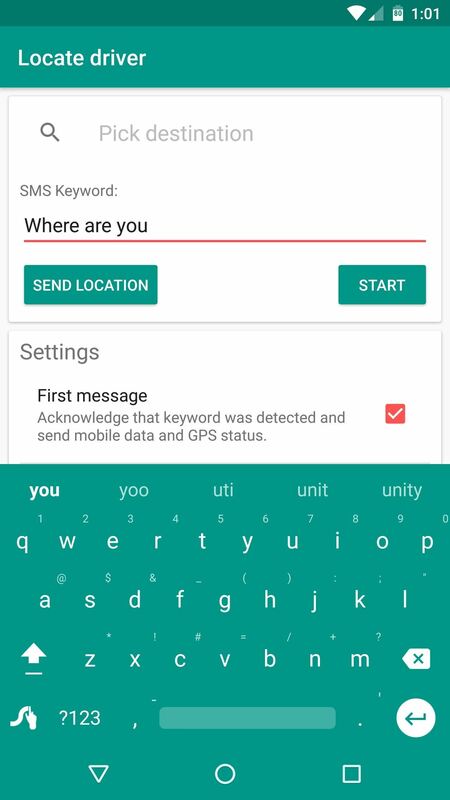 So start by entering a keyword or set of words into the field labeled "SMS Keyword," and share this keyword with people you trust to know your location. Your keyword can use spaces, punctuation, and other special characters to make it specific to you and unique enough that your location won't be sent to texters who don't know the code. 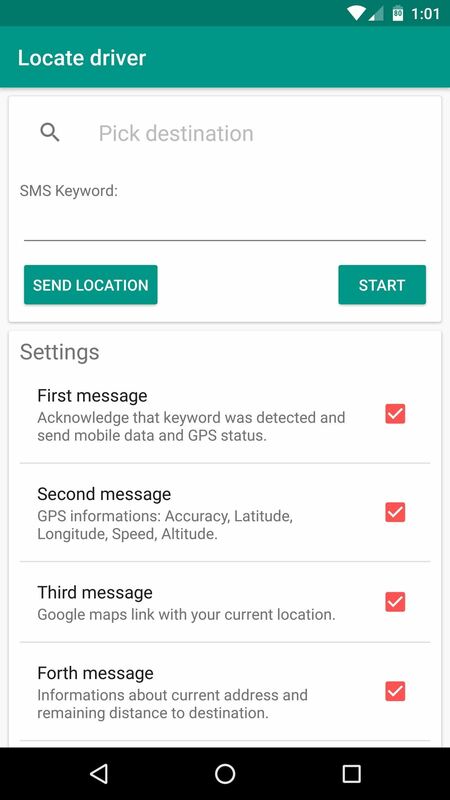 Then, Locate driver will send up to 4 messages when the other person requests your location, and each of these messages contains some useful information that is described under the Settings category. You can also disable any of these messages, by unchecking the boxes next to them. When you're done, though, tap the "Start" button, and you'll be all set to go. 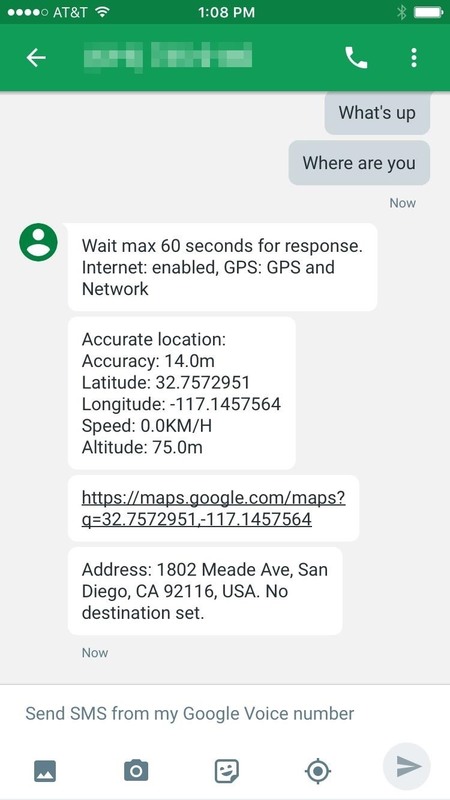 Locate driver does not run in the background at all times—instead, it simply wakes up when you've received an SMS, then checks to see if there's a keyword match. This means that the battery impact almost nonexistent, because the app is only active for a few brief seconds at a time. From now on, when someone wants to know where you are while you're driving, just make sure they send you an SMS message containing your keyword, and only your keyword. Shortly after they do that, they'll receive a few messages that list your location, altitude, speed, and address. 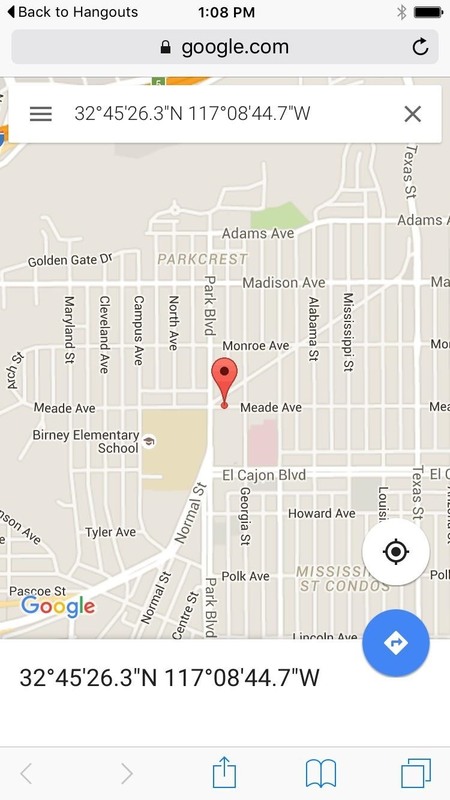 There's even a clickable link that the other person can use to view your location on the map, and it works with any smartphone. None of this would be possible with an iPhone, because user-installed apps on iOS don't share data amongst themselves. With Android, however, apps like Locate driver can see when you've received an SMS, gather data from your phone's sensors, and send a customized text message over to your messaging app, which is then relayed to the other person. Am I crazy for thinking that this would be incredible if someone were to go missing? Within moments of suspecting someone has been abducted or is lost or having car trouble, you could find out where they are, and they could find you if the situation were reversed. As a mom, I want this for my kid's phone. As a woman, I want it on mine "just in case." It wouldn't matter if the bad guy had your phone or not, it would just automatically reply with your location. That's pretty cool. I downloaded/installed this and it does not work. I am using an LG Stylo. It doesn't work with the stock android messenger or with my custom app Textra. If I physically click "send location" it sends the location, but the keywords don't work at all, either as a phrase or a single word. Super disappointing. I don't have a G+ account, so I can't leave feedback on GP (THANKS, GOOGLE) but now you have it here. One star. Bad app. I'm curious if anyone else can get this to work. It should work on 5.1.1, I'm not sure why it's having problems. One thing you can try is emailing the developer (micku7zu at gmail). He has been very responsive when someone finds a bug like that, I've seen him issue several updates just to get it working on one particular phone model.